Louise Conde White was born in 1875. She attended the East Side School in Batavia. While she was a student, a fire started on the roof of the building. A child yelled “Fire!” and all the children ran out. When the people of Batavia heard the East Side School was on fire, many of them came running. They saved many books and some desks from the first floor. The school was rebuilt and Louise was able finish her elementary grades. She attended and graduated from Batavia High School. She then attended Northern Illinois Teachers’ College in DeKalb and graduated in 1894. Miss White began her pedagogic career in 1894 at a country school south of Batavia. She taught in the Batavia schools for 10 years, was one of the school staff at St. Charles for five years, and returned to Batavia to round out her long service to the youth of the Fox Valley. She taught until 1922. She then served as a principal until 1934 at the East Side School in Batavia, which was located at 24 N. Washington Street. 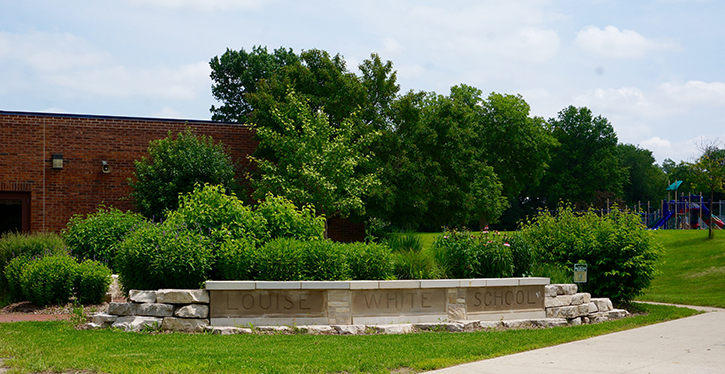 The East Side School was named “Louise White School” in 1922. It closed in 1978, and a new building was built on 800 N. Prairie Avenue, which is the school we know today.